Poet, composer, and storyteller Travis Edward Pike originally wrote “Grumpuss” in 1969, to amuse his 5-year-old daughter, Lisa. She must have liked his rhyming tale of a knight sent by his king to vanquish or tame a huge, prehistoric cat, because it was she, all grown up, who urged Travis to adapt it into an illustrated book and feature film project. He took her advice and in the normal course of development, in his brother, Adam’s, recording studio in Pasadena, California, recorded an audio demo. A motion picture would run to many millions of dollars, more than Pike’s independent production company could hope to attract, but a preliminary budget for a made-for-TV video production of a live performance might be within reach. England was a likely setting for his tale of knighthood and chivalry, but both Scotland and Wales had long-standing bardic traditions and all three have castles, ruined and intact, which might provide stunning locations as well as a bit of history, perfect settings for a performance that harkened back to the bards of old and that form of entertainment once reserved for kings, noble lords and outlaws. Over the next three years, “Grumpuss” was rejected by every PBS, network and cable outlet Pike contacted. They all loved it and wished Pike the best of luck, but none felt it was commercial. Some even said it was just way over the heads of their viewers. Pike was dumbfounded. What demographic study made PBS believe they were appealing to such benighted audiences? His little girl had fallen in love with “Grumpuss” when she was starting Kindergarten! He might have given up on it had it not been for a surprising letter from Dr. Judith Stanton, an English professor at Bridgewater State College in Massachusetts. Unable to recruit an actor willing to memorize and perform the entire epic narrative rhyme, Pike, whose original storytelling rhymes were heard in New England coffeehouses as far back as the mid-sixties, decided to do it himself. His performance won widespread critical acclaim. The March 1999 Midwest Book Review reported "Travis Pike gives a storytelling performance that is a sheer delight." The Spring 1999 Swag of Yarns, Australia's National Storytelling Magazine, wrote of Pike's audio performance, "This fantasy tale is of the hunting of the Grumpuss, an animal so dangerous, so gigantic it was more fearsome than a dragon and had not been seen by man for many years. His instructions were to seek and destroy. The tale is told in rhyme with minimal use of sound effects and with an orchestral backing. Travis is responsible for the composition of both the music and verse. For approximately eighty-four minutes his voice carries you into another world. It was hard to listen to the complete tape in one go—children, phone and animals conspired against total relaxation. But Travis is such an excellent and obviously experienced teller that the interruptions did not break the continuity of the tale at all. These tapes should definitely be listened to on a winter’s afternoon with a good glass of red wine and a fire burning in the hearth. This is a storytelling experience from a great teller and a true master of this medium. Fantastic . . . a storyteller's dream suitable for all ages except the very young." And the October 1999 School Library Journal reported that "Pike's superb skill as a storyteller elevates the tale to a rare level. The rich language and Pike's voice variations paint vivid pictures in the listener's mind...an outstanding choice for school and public library collections." And jaws that can crush armor flat!" That original release of “Travis Edward Pike’s Grumpuss Audio Theater Production” (Otherworld Entertainment Corporation, 1978), was issued as a dual cassette release. Travis Pike’s storytelling performance was recorded at Phil Yeend’s NSI studios in Burbank, California, with M&E (music and effects) tracks created and mixed at Adam Pike’s studio in Pasadena. 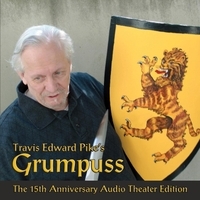 This upgraded, 2013, Otherworld Cottage Industries dual CD release of “Travis Edward Pike’s Grumpuss: The 15th Anniversary Audio Theater Edition,” features Adam’s restoration of his brother’s original performance with re-recorded passages, fresh music and effects tracks, remixed for CD.